Bargain hunting during the sales is the most fun you can have even when the last thing you need is more clothes. It’s a primal rite of summer, where the hunter-gatherer tracks down, captures and brings back that bargain trophy to her lair. There is a very fine line (as discussed in Wednesday’s blog http://lobfashion.blogspot.com/2011/06/loud-pants-fast-returns-it-must-be.html) between what is a genuine find and those other unworn ‘bargains’ glaring accusingly at you whenever you open your over-stuffed wardrobe. But it’s during the sales that us grown women are separated from the girls, when, ahem, age and maturity inspire classic purchases rather than rash impulse buying. Unfortunately, being separated from the girls also means that that true bargain buy is only left in a girly size 8.
in the sales in London for €132, and sported it at Wimbledon yesterday. 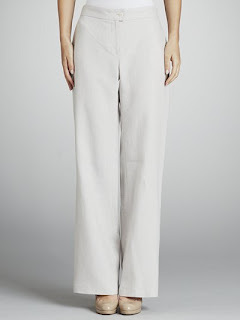 now €89 (approx) , which are less baggy and more flattering than similar styles elsewhere. 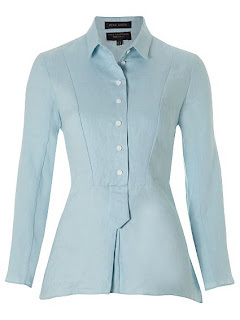 The tailored linen shirt with plaquet front comes in a flattering shade of sky blue, €109 (approx) and would work well with those simple trousers. LOB’s favourite among the reductions is this more expensive (and isn’t it always) tailored black jacket, now €149 (down from €279). Gorgeous PC Jacket! Is it compatible with Macs? !